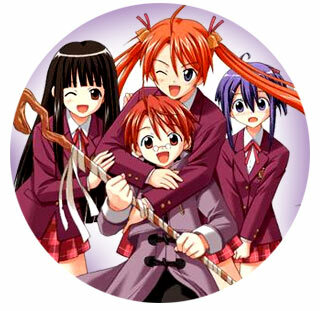 Negima, from Love Hina's creator, Ken Akamatsu, is basically what happens when you take an underage wizard, and throw him to the wolves... or in this case, a class of 31 hormone-frenzied teenage girls who all happen to find him adorable. In this OVA (based on the series), Ayaka arranges a romantic getaway, determined to lift the little professor's spirits (and possibly something more! ), but when the rest of the group finds out, the outing turns into a no-holds-barred spring break in a warm tropical paradise. 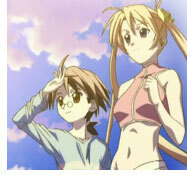 Rest assured that the bathing suits are sparse, and should Negima accidentally sneeze, even their itty-bitty outfits will disappear in a puff of magic. Later, a magic spell goes awry, and Negi finds himself on a short leash — harnessed to Nodoka! And while it may be a dream come true for the soft-spoken bookworm, an impromptu trip to Ayaka's family spa ensures it will turn into a hard-core nightmare! This is Negima after all, and you want him to bathe? While attached to a woman? Who needs viagra when you've got these hot ladies vying for your attention? 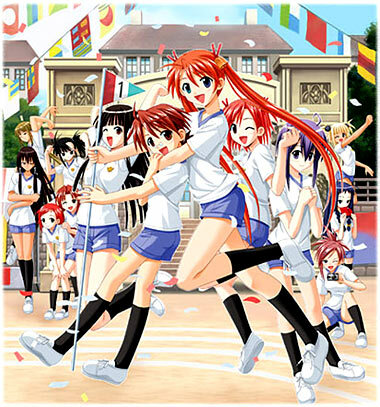 Below: Promotional artwork from Negima.